Police in Kenya have arrested several people in connection with two caches of illegal ivory seized in Thailand and Singapore respectively. Abdurahman Mohammed Sheikh, a tycoon living in Mombassa, Kenya, and his two sons were taken into custody for their alleged involvement in illegally shipping ivory from the port of Mombassa to Asia. The investigation that lead to the arrests was conducted by a joint team of detectives drawn from the Kenya Police Service, Kenya Wildlife Service, Kenya Revenue Authority, Kenya Ports Authority, the Ethics and Anti-Corruption Commission, the Director of Public Prosecutions and Interpol's Environmental Crime Desk regional bureau. "We will never halt the illegal ivory trade unless we are willing to throw kingpins and their middlemen behind bars, in addition to the poachers," says African Wildlife Foundation CEO, Dr. Patrick Bergin. "The coordinated investigation that led to yesterday's arrests is exactly the kind of whole-of-government approach we need to tackle this elusive yet pervasive industry. All of Kenya's agencies involved in the investigation should be commended." African Wildlife Foundation (AWF), along with partners IFAW and Freeland Foundation, has been working to strengthen the law enforcement response to combat wildlife crime at the regional level by improving cooperation among African countries’ law enforcement authorities. The work is being carried out under a continent-wide program called ARREST (Africa’s Regional Response to Endangered Species Trafficking) and implemented by the partners with support from the U.S. Department of State, Bureau of International Narcotics and Law Enforcement Affairs. In April, Thai customs officials seized three tonnes of ivory, marked as tea leaves in a shipping container, coming from the port of Mombassa and bound for Laos. The seizure came one week after Thai officials discovered another cache of illegally shipped ivory, estimated at four tonnes, en route to Laos from the Democratic Republic of Congo. In May, authorities in Singapore, operating on a tip-off from Kenya Revenue Authority customs officials, seized a shipment of ivory worth US$6 million en route to Laos from Mombassa. The elephant tusks, along with rhino horn and canine teeth, were disguised in two 20-foot shipping containers marked as tea leaves. Kenya's the Daily Nation newspaper reported that a cargo-scanning loophole at the Mombassa port was likely being exploited by ivory traffickers, as tea exports were exempted from the cargo-scanning process. 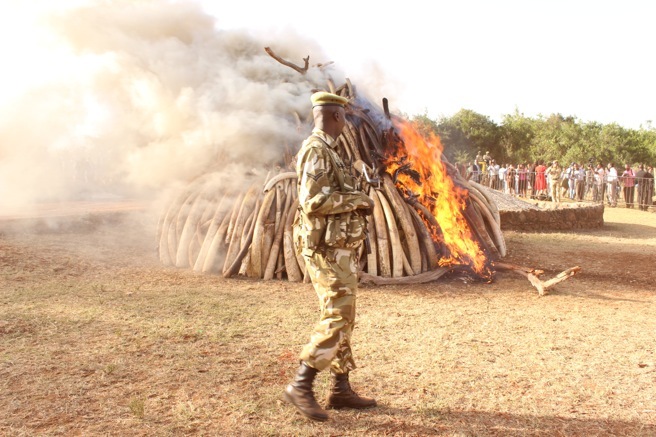 In addition to Abdurahman Mohammed Sheikh and his two sons, several others in connection to the illegal ivory seizures have been arrested. "Kenya is sending a message that no matter your status or wealth or political connections, you will be brought to book if you are involved in the illegal wildlife trade," says Bergin.